One of the most controversial topics in politics - let alone energy policy - is how much customers with solar panels should be paid for their generation output. Australian Governments have wound back generous subsidies and feed-in tariffs introduced at the dawn of Australia’s solar sector, with the New South Wales Solar Bonus Scheme closing at the end of this year. 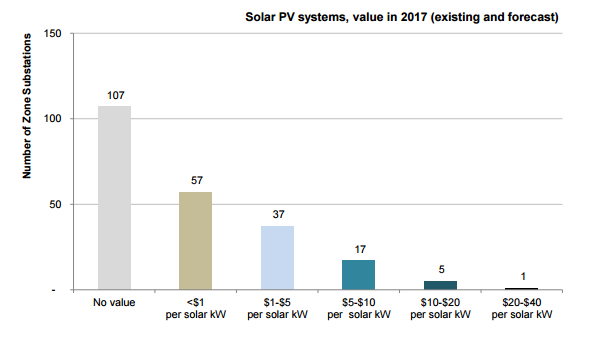 The Australian Energy Market Commission and Grattan Institute have also pointed to the indirect cross-subsidies provided to solar PV simply due to outdated network tariff structures, with the Grattan Institute estimating an unintentional cross-subsidy of $3.7 billion from other users. During 2016, the Essential Services Commission of Victoria (ESCV) has been undertaking a significant two part study assessing both the energy value and network value of distributed generation. The very title of its review, ‘The True Value of Distributed Generation’, reflects how contested the issue of incentives for solar and other distributed resources has become. The first stage of the study on the energy value has already seen a Government commitment to a time-varying Feed In Tariff. The greatest value for networks is when distributed generation efficiently reduces ‘energy at risk’ – given the amount of expected unserved energy due to congestion of a network asset influences the timing of network augmentations. Only a few substations will exhibit a material energy at risk and these instances may only occur for a small period (as small as one hour). The time when substations will exhibit energy at risk will vary between substations resulting in non-uniform times at which distributed generation will provide network value. The distributed generation only provides value if the network has “firm” access to reduce energy at risk when it needs it. Analysis by consultants ENEA for CitiPower and Powercor suggested that the proportion of locations where distributed generation would provide value was lower. It predicted only 2 of the 105 zone substations analysed would receive material benefit from DER in 2017. The value of the grid services that distributed generation can provide is too variable – between locations, across times, and between years. [A broad based feed in tariff] could lead to payments to distributed generators who were not providing benefits, while at the same time, not sufficiently rewarding those who were. Instead, the ESCV is looking for market mechanisms that provide adequate opportunities for small-scale grid service providers, to be remunerated for the grid services they provide. This includes supporting the participation of these providers in a well-functioning market for grid services. provide $16.7 billion in economic benefit to the community. New demonstrations of these partnerships between networks and distributed energy resources are emerging every day. This week, energy networks United Energy and Essential Energy announced participation in a trial involving over 150 customers using smart inverters with solar PV and storage to support network power quality and stability. The trial led by the UTS Institute of Sustainable Futures will also involve storage software maker Reposit Power, solar technology provider SMA Australia, the Australian Photovoltaic Institute, and the NSW and Victorian Governments. Just last week, the National Association of Regulatory Utility Commissioners (NARUC) released a comprehensive manual aimed at assisting jurisdictions in developing policies related to DER compensation. The Manual identifies issues and questions that jurisdictions may wish to consider when adopting possible rate design and compensations. The report highlights the considerations that regulators need to balance when valuing DER and appropriating this value through tariffs. Submissions to the Victorian Essential Services Commission draft report on the True Value of Distributed Generation are due on 12 December, with a final report due to the Government in February 2017.